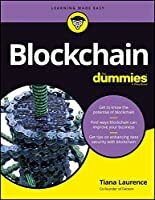 To ask other readers questions about Blockchain For Dummies (For Dummies, please sign up. The book is really 3.5 stars, I do not like the 1-5 scale, it is not granular enough. conversely there are parts that hit the "nail on the head". Blockchain and related technologies such as digital currencies are recently receiving significant media attention, being hailed as the “fifth evolution” of computing. However, it can be a little hard to get a grasp on exactly what these technologies are, how they work, how they can be used and what kinds of applications they might have. Blockchain for Dummies, authored by a co-founder of a blockchain company, therefore seems an ideal title to help the uninitiated to begin to understand these new Blockchain and related technologies such as digital currencies are recently receiving significant media attention, being hailed as the “fifth evolution” of computing. However, it can be a little hard to get a grasp on exactly what these technologies are, how they work, how they can be used and what kinds of applications they might have. 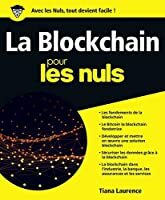 Blockchain for Dummies, authored by a co-founder of a blockchain company, therefore seems an ideal title to help the uninitiated to begin to understand these new and relevant concepts. The book is structured into five sections. An introductory section aims to apprise the reader of what blockchain is and why it is of interest. The following two sections review currently available blockchain implementations and respectively introduce key players in the blockchain space, identifying differences and similarities between them, and consider blockchain platforms. Section four is more speculative, giving the author's view of the potential future impacts of blockchain technologies on various industries. The final section gives practical advice on learning about and using blockchain. In principle then, the book covers the key topics that would enable readers to start to get to grips with blockchain and cognate technologies, and indeed the book does contain a great deal of interesting and relevant content. However, I felt that the book was let down by three key factors. Firstly, as a ‘for Dummies’ title, the text should assume the reader has little or no prior knowledge of the subject matter. However, in some cases, topics are referred to before being introduced, or in the case of ‘oracles’ without ever being introduced. Secondly, while the author is evidently knowledgeable and enthusiastic about the subject matter, I found her almost stream-of-consciousness writing style somewhat irritating and distracting. Often the narrative is presented as terse sentences, which sometimes seem to lack direction and repeat content. Finally, there are numerous typographical errors throughout the book which should have been edited out. In summary, I think this is a useful introductory book, but there is plenty of scope for improvement. 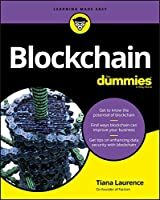 This book anticipates series of queries a novice would have on blockchain technologist answers them efficiently. Also provides ample directions to further explore. In 5 hours - when you read this book from cover to cover you are guaranteed to have better understanding of the concept and its application along with a ready reckoned to where to go for further reference. Excellent. Gives a brush across the Blockchain scape, looking at key technologies and endeavours. It also introduces to some of the key services using Blockchain. Really helpful to get an overall idea about how blockchain works and is being used. Good primer on the current state of blockchain. The editing could've been tighter as there are quite a few typos in this book. I didn't read the book cover to cover, but the sections that were most relevant to me. This is not really a for dummies book, actually it's quite detailed in its descriptions. Coverage was scattered. The book attempts to get readers to a practical level of usage without introducing core principles. An okay overview but the book doesn't have enough depth or substance. The number of basic English mistakes was surprising. A good introduction to a very technical subject. 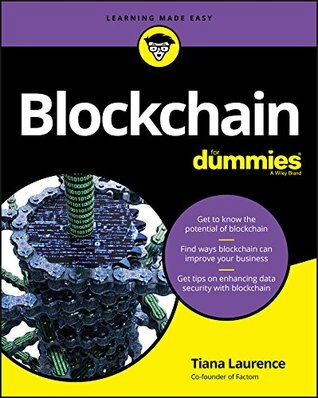 I must be a real dummy, because I barely understand blockchain any more now than I did when I first opened the book. This is not entirely the author's fault -- blockchain is just a hard topic. One thing though: I spotted more typos, misspellings, and just plain errors in this book than I've seen in a dozen other books. "For Dummies", for shame! Fix your copyediting system!! !